One problem with the Black–Scholes model is that empirically observed log returns of risky assets are not normally distributed, but exhibit significant skewness and kurtosis. If large movements in the asset price occur more frequently than in the BS-model of the same variance, the tails of the distribution, should be “fatter” than in the Black–Scholes case. Another problem is that observed log-returns occasionally appear to change discontinuously. Empirically, certain price processes with no continuous component have been found to allow for a considerably better fit of observed log returns than the classical BS model. Pricing derivative contracts on such underlyings becomes more involved mathematically and also numerically since partial integro-differential equations must be solved. 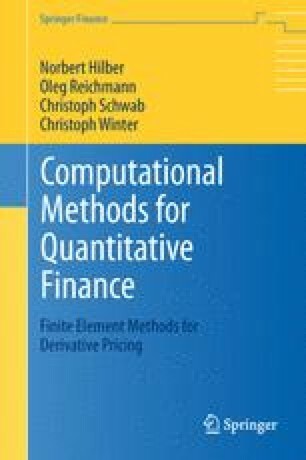 We consider a class of price processes which can be purely discontinuous and which contains the Wiener process as special case, the class of Lévy processes. Lévy processes contain most processes proposed as realistic models for log-returns.